I'm Swedish, and consider myself Animistic IndoPagan, whats central in my spirituality is that everything is religious, so something that's not religious do not exist, also there is no divine above us, everything is souls/the spirit, there's some string theory in this and I'm also inspired by Hinduism, except Animistic religions and other pagan religions ...Sweden is a Christian country, but we have some paganism that's still here, especially in our holidays like Jul and Påsk(Easter), We still have the pagan word for Jul, and during Påsk kids dresses up like Easter witches and walk around the neighbourhood to get candy, etc. I sincerely hope you enjoy this place, there's so many wonderful people here, many topics to explore and an abundance of areas for you to meet others of like mind. 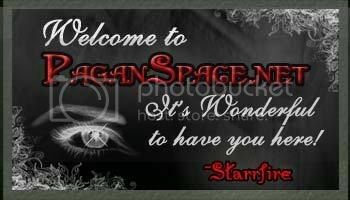 Once again, Welcome to Paganspace.net!